Images need to have a certain minimum resolution to be printed at a good quality. The required resolution depends on the type of printing. That is why the preflight process should check if all image resolutions exceed a minimum threshold value. Images that have a resolution that is too high lead to bloated files that take longer to transmit or process. If a design contains very thin lines, these may disappear on the printed result. Therefore it is best to check the minimum line weight, which depends on the intended printing process. Check if grayscale objects aren’t set to overprint. Overprinting grayscale objects can lead to excessive ink build-up, not to mention that the graphic sometimes becomes so dark that it cannot be distinguished from the background anymore. 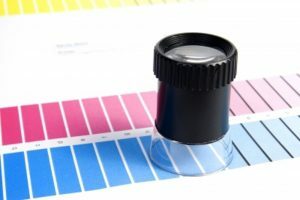 When several colors are printed on top of each other, there is a limit to the amount of ink or toner that can be put on paper. This maximum total dot percentage is referred to as either TIC (Total Ink Coverage) or TAC (Total Area Coverage). When a designer ignores this technical limitation, the ink that gets laid down last won’t attach properly to the previous layers, leading to muddy browns in neutral areas. The ink also won’t dry properly on the press sheets. This can cause set-off where the ink of a still wet sheet rubs off on whatever is stacked on top of it. If RGB is used in the file, the artwork will not be printed properly. Any or all of these checks can be performed automatically at any stage of the workflow process. The customer can decide which checks to perform in the workflow. Also, if a particular check fails, the workflow can be configured to take any action. The default action is to reject the artwork and return it back to the designer. The workflow can be configured to do other actions also, like give a warning regarding the failure of the preflight checks and move on to the next stage in the workflow. ManageArtworks is a Packaging Artwork Management Software that helps regulated industries like Pharmaceuticals and CPG to ensure regulatory compliance of their pack labels. It connects all stakeholders into an automated workflow, empowers users with sophisticated proofing tools including Preflight tools that reduce errors and minimize cost of reprints and gives complete transparency to the entire process with approval request tracking, audit trails and dashboards. Click here to know more or visit this link to try the product for 21 days.